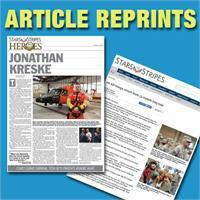 Now you can request reprints of staff-written Stars and Stripes articles. 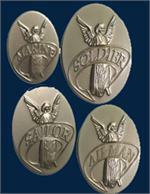 All reprints are supplied as color laser prints furnished on 11x17 paper with crop marks indicated. Price includes two color laser prints. All articles written by Stars and Stripes reporters are copyrighted. Reprint permission will be granted ONLY for personal use, in this case for framing. If any other use is intended, please contact David Gardiner (gardiner.david@stripes.com) for permission PRIOR to using the content. Finally, you may not repost any of Stars and Stripes copyrighted material on any form of social media site such as Facebook, Twitter, etc. For volume pricing, please email info@stripesstore.com. Important Note: Reprints of articles written by other than Stars and Stripes journalists are not available.